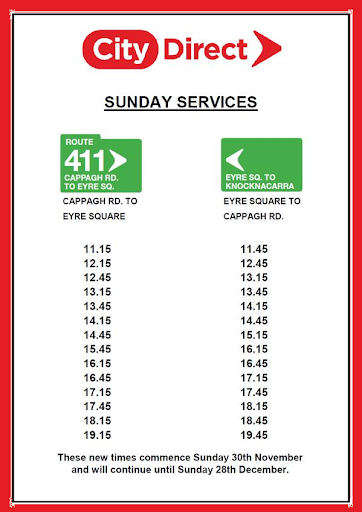 City Direct are running extra services on route 411 (Knocknacarra - Galway city via Claddagh, Dominic St, Henry St / The West, UGH / Shantalla, Rahoon and Upper Clybaun Rd), on Sundays for the month of December - as shown below. See their website for full timetable information, or the Galway City bus summary for other options. See Galway City park-n-ride for details of other Christmas special services.